I bought this a while back. Probably about a year or so ago, maybe a bit longer. I'll be honest. I bought it for the bottle. It's looks a bit like it was designed as a school project. And I loved it for it. Visible hot glue, a copper neck tag that looks hand wrapped and a hand written ID tag with the barrel number and barreling date. It just adds to the craftiness of it all. And it would have sat there just looking all crafty-cool if I hadn't taken the behind the scenes tour at the Heaven Hill distillery last September and learned a little nugget of info that sparked my curiosity. We were being given one hell of a cool tour and our guide was telling us a little about aging. 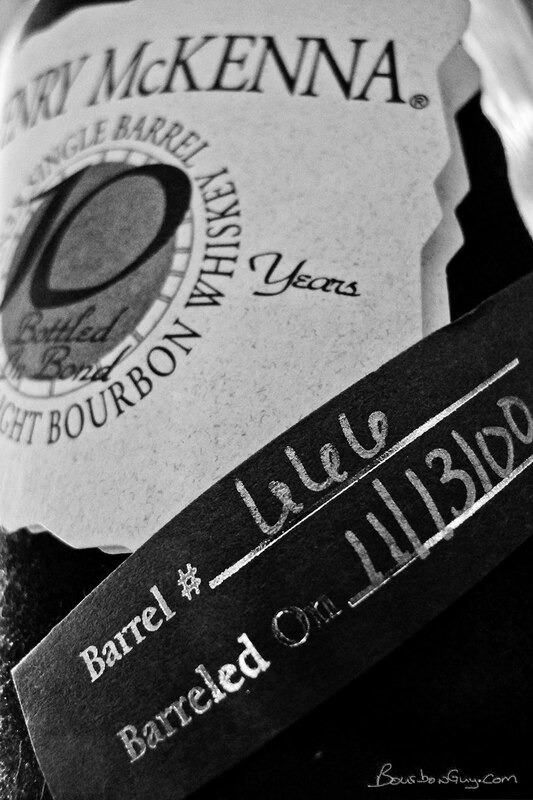 He told us that, obviously, Heaven Hill ages their barrels all over the place. Now there are some of these barrels that end up on the sunny side of a hill (I think he mentioned this facility was up by Louisville, but that was 6 months or so ago, I might be misremembering that part). Now according to the guide, these barrels age to be a bit harsher than those barrels that are destined to become the flagship Evan Williams. But that, in a odd quirk of fate, because there are fewer of these barrels you will actually pay more for a bottle of Henry McKenna than you would for the "better" Evan Williams. How much of that is true? Probably some of it, but it's a good story so I'll let any embellishment slide. I'm a firm believer in not letting the truth get in the way of a good story. But it did spark my interest. I wanted to see if this Bottled in Bond version followed those same themes. And now that I've emptied it, this is my last chance to share my findings. Mouth: FIRE! This is a hot one! It's just a big bucket of burn. Adding a little water calms it down a bit, allowing it to show it's sweet side. Finish: What do you know? There's a hot finish too. After the heat fades it brings back a bit of the cherry and some bitterness that dries the mouth. Thoughts: I like this more for the story and the bottle that it's in, than for what's inside it. Everything about this one is hot. Might be nice on a cold winter's night, but it's (finally) showing signs of spring here and it's not to my tastes right now. A small piece of ice does help to tame it though. For the time and place I'm in right now, I'm going with meh. But if you like hot bourbons that can bring the burn, this one might be just for you. UPDATE: Do you not agree with this review? Well, guess what after four and a half years, I didn't either and I decided to revisit it. Check out the current review here.